Enhance art and drafting skills to another level with a station that boosts creativity and expertise. Developing skills as a professional or talent of an artist requires the right tools for success. Instead of scouring for a desk lamp, an awkward table and a comfortable chair, the Berkeley 4-pc Drafting Station Combo, covers all aspects. Equipped with a tray lamp, the sturdy folding, Berkeley table top and drafting chair - the combo will start delivering results instead of location frustration. Set up the station combo in any room and have tools within reach with the side tray for materials and utensils. No more balancing acts of locating a reliable desk and steady lamp, the tray lamp is included with the station to provide the perfect touch on drafts and art creations. Perfect for the student, expert or beginner seeking to boost their talents. 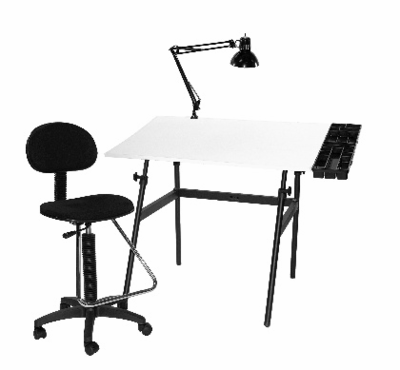 Designed with the Berkeley Classic brand, the drafting station combo will be the perfect finish to a new office. Select a space and with required assembly, develop the perfect environment for success.